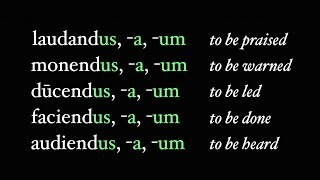 The future passive participle, also known as the gerundive, is used in the passive periphrastic in order to express obligation or necessity, and also in gerundive phrases. 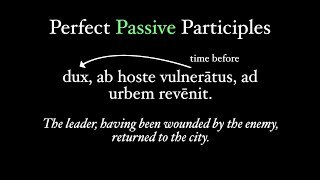 The perfect passive participle is the fourth principal part of the Latin verb. 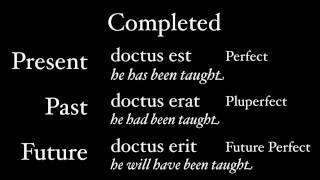 This video covers the formation and use of Latin's past participle, with only one bad joke about James Bond's martinis. 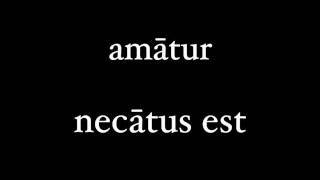 The participle in Latin is exceptionally important, even more so than it is in English. 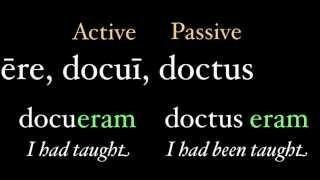 This video reviews the four participles of a standard verb: the present active, perfect passive, future active, and future passive (the gerundive), along with discussing how deponent verbs form their four participles. 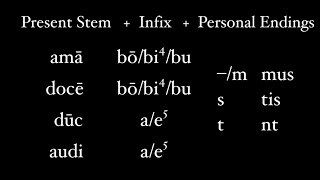 The pluperfect passive subjunctive is linked to the indicative conjugation of the pluperfect - swap out the imperfect indicative of sum with the imperfect subjunctive, and the conjugation falls easily into place. 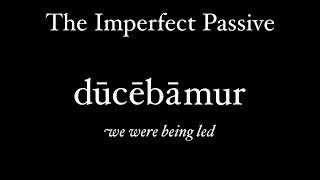 The conjugation of a verb in the perfect passive subjunctive requires just a small change from the indicative mood of the perfect passive. Just change the form of sum to sim (or its other forms for other persons and numbers), and you're all set. 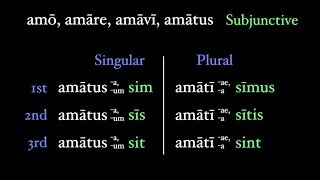 The conjugation of verbs into the imperfect passive subjunctive is just as easy as into the imperfect active subjunctive. Except now we have to worry about deponents, though, and that might make life just a little bit more complicated. Don't worry, though: it's easy if you know the nuts and bolts of the imperfect tense. The present passive subjunctive is very similar to the present active subjunctive. You still have your vowel shift (We fear a liar or Wendy wears a giant diaper), but instead of the active endings, you use the passive ones. Simple, no? 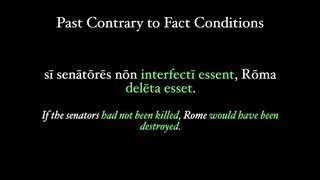 Don't forget that the passive of facio is fio, though. 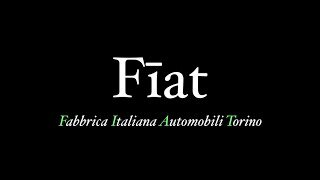 This will help you when you come to words like "fiat". The future passive may not be the most popular, or even the easiest, of all the tenses, but that shouldn't diminish its importance. By learning about the future passive, you practice your passive and your future at the same time, especially the differences between 1st/2nd conjugations and 3rd/4th conjugations. By the end of this video, you will have been taught the future perfect passive. 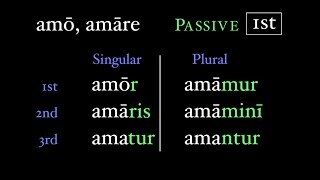 This tense formation as similar to the pluperfect passive as it is not used in much of Latin literature. No matter, learning it it part of the process, and this tense-mood combo typically completes the study of the indicative mood. This video is entirely a "has been" as we explore the passive voice of the perfect tense. Finally, we use the fourth and last principal part, along with the present of sum, of course. And don't forget to plural the participle! If you know the imperfect active, then the passive will be a cinch. All you need to do is trade the active endings for passive ones (-r, -ris, -tur, etc. ), and you're game. The present passive may be tough to understand, but its formation if pretty simple. 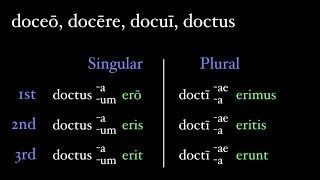 Instead of the active endings (-o/m, -s, -t, -mus, -tis, -nt), we just use the passive ones (-r, -ris, -tur, -mur, -mini, -ntur). It's so easy in fact, I am surprised, you are surprised: We are surprised. 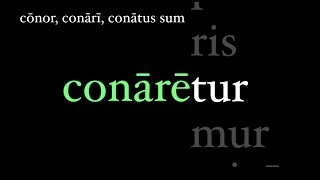 Turning an active sentence into Latin is easy, sort of. 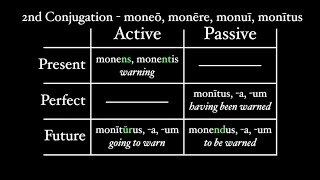 The active-accusative becomes the passive-nominative, and the active-nominative becomes an ablative (of means? of agent with ab?). Oh, and don't forget to change the verb! 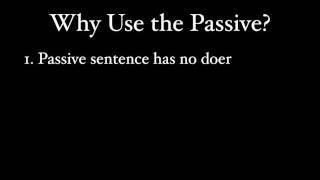 What's the passive voice, and why would you even want to use it? After all, Microsoft Word thinks it's bad. This video covers how English uses the passive voice, from converting active sentences into passive ones, and when the passive should be used (hint: moderately).